The newly organized undertakers’ association of South Carolina starts out with every prospect of a long and prosperous career. All the officers are young and progressive funeral directors, and are thoroughly up with the times. The Sunnyside has been able to publish portraits of the Palmetto State men and appends brief sketch of each. J. M. Connelley, president, is a fifty-year old hustler, and was the first to introduce embalming in South Carolina, as well as his own city, Charleston. He has been undertaking 13 years, during which time he has embalmed and shipped bodies to all points in the United States, Canada, Cuba and many other quarters of the globe, from which he holds testimonials. He has been as well a leader in introducing modern methods for conducting business, having built a modern building exclusively for undertaking, which is pronounced one of the best known to the profession anywhere. The offices, reception, trimming and show rooms, morgue and warehouse have been declared simply perfect. The appearance of the place is picturesque. The lot has a frontage of 200 feet and a depth of 230. On one side is his establishment, and on the other his residence. In the intervening space is a floral garden with fountain and gold fish, while six large greenhouses and his casket factory are in the rear. James F. Mackey, of Greenville, first vice-president, is a native of Columbia, S.C., where his father was engaged in the furniture and undertaking business prior to the Civil war. In 1862, when a small boy, his parents removed to Greenville county near the city, where Mr. Mackey spent his boyhood days engaged in farming. Twenty-three years ago he removed to Greenville and engaged as clerk for J. C. C. Turner, then in the furniture and undertaking business, where he remained for seven years. With Geo. L. Dantzler he in 1883 formed a partnership, and conducted a very successful business for five years. Mr. Mackey, after the expiration of this co-partnership in 1888, sold out to Mr. Dantzler, and became a partner with his old employer, under the name of Turner & Mackey; this continued until 1894, when Mr. Mackey withdrew and bought the business formerly conducted by Mr. Dantzler, the latter having died. He bought the stock and outfit of Mr. Turner last year, Mr. Turner retiring. He now conducts his own business. Mr. Mackey is a great “Order Man,” being an active and leading member of several, among them the Masons, Odd Fellows, W. of U., A. O. U. W. and K. of P. He is a deacon in the Second Presbyterian church, and for the past eight years has been a member of the Board of Public Education of the city. For many years he has been at the head of the fire department, and takes a leading part in all the social affairs of his section. Mr. Mackey is considered a fine embalmer, he having had instructions from Prof. Clarke in 1886, afterwards graduated from the old Egyptian school, under Prof. Sullivan; then took a second course under Prof. Clarke. He is an enthusiastic association worker, and took an active part in the organization. 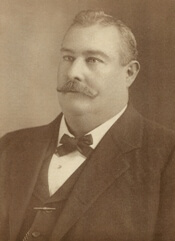 William W. Moore, Barnwell, second vice-president, is a leading undertaker of Barnwell county, and is thoroughly progressive, keeping well in advance in his profession and in public affairs. He is a member of the city council, and is highly thought of. He is of course an expert embalmer and a conscientious funeral director. George W. Bolger, secretary, is a youngster of 30, and was born and reared in the city by the sea. He has been undertaker and embalmer eight years, in which time he has built up a patronage second to none in Charleston. He is known as a hustler. Wade Hampton Dukes, treasurer, Orangeburg, was born and reared in Orangeburg county on the farm of his father, John H. Dukes, now sheriff of that county. Although his opportunities for education were limited chiefly to brief winter seasons, he made the most of them. When of age he served as clerk in Orangeburg for a year, and then ran a nice grocery business for three years. In 1892 he sold out to become deputy sheriff under his father, which office he has held ever since. 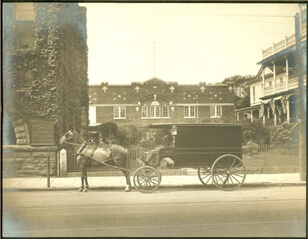 In 1896 he opened as an undertaker, and is the only one in the city. He is an expert embalmer, with an embalming school diploma, and runs three hearses and wagon and does a good business.